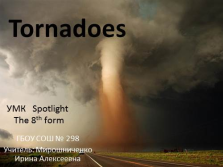 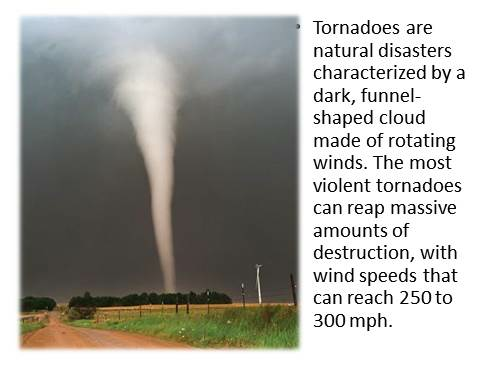 Tornadoes are natural disasters characterized by a dark, funnel-shaped cloud made of rotating winds. 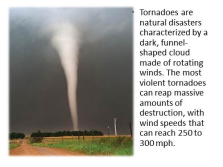 The most violent tornadoes can reap massive amounts of destruction, with wind speeds that can reach 250 to 300 mph. 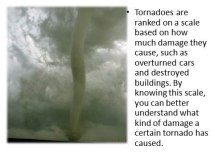 Tornadoes are ranked on a scale based on how much damage they cause, such as overturned cars and destroyed buildings. By knowing this scale, you can better understand what kind of damage a certain tornado has caused. 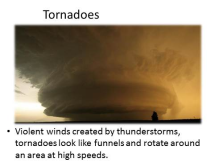 Violent winds created by thunderstorms, tornadoes look like funnels and rotate around an area at high speeds. 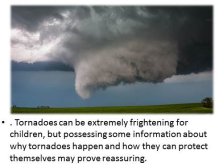 Tornadoes can be so fast and strong that when they appear on the ground, they can damage anything in the way, including buildings and cars.
. Tornadoes can be extremely frightening for children, but possessing some information about why tornadoes happen and how they can protect themselves may prove reassuring. 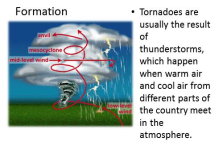 Tornadoes are usually the result of thunderstorms, which happen when warm air and cool air from different parts of the country meet in the atmosphere. 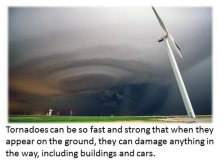 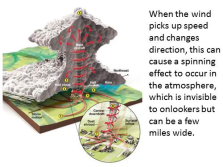 When the wind picks up speed and changes direction, this can cause a spinning effect to occur in the atmosphere, which is invisible to onlookers but can be a few miles wide. This effect starts off in a horizontal direction, but soon becomes vertical thanks to rising air. 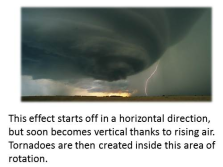 Tornadoes are then created inside this area of rotation. 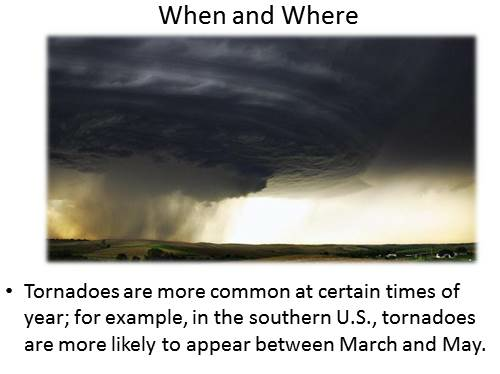 Tornadoes are more common at certain times of year; for example, in the southern U.S., tornadoes are more likely to appear between March and May. 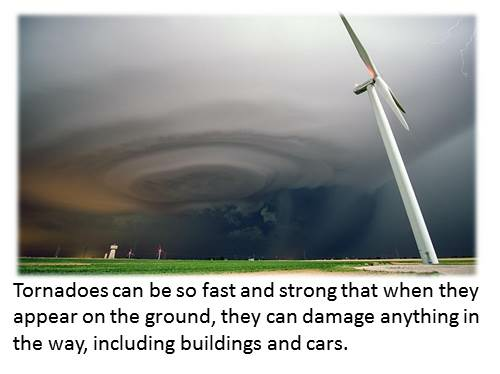 The amount of damage a tornado can cause depends on how fast it’s traveling. 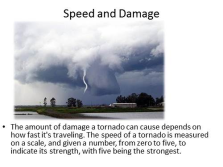 The speed of a tornado is measured on a scale, and given a number, from zero to five, to indicate its strength, with five being the strongest. 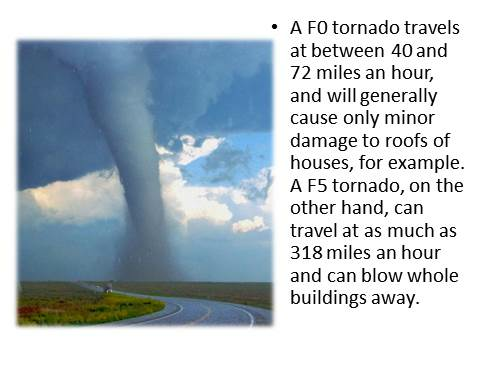 A F0 tornado travels at between 40 and 72 miles an hour, and will generally cause only minor damage to roofs of houses, for example. 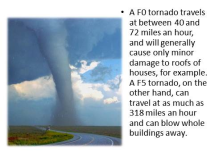 A F5 tornado, on the other hand, can travel at as much as 318 miles an hour and can blow whole buildings away. 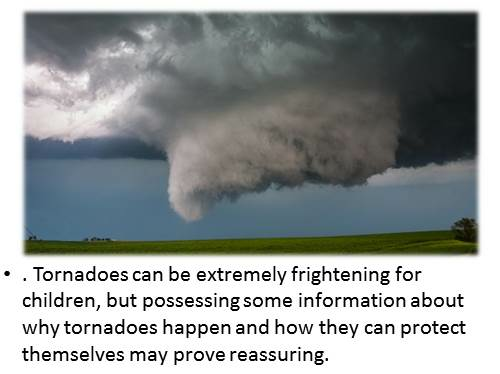 Individuals should listen to advice given by local authorities about tornadoes. 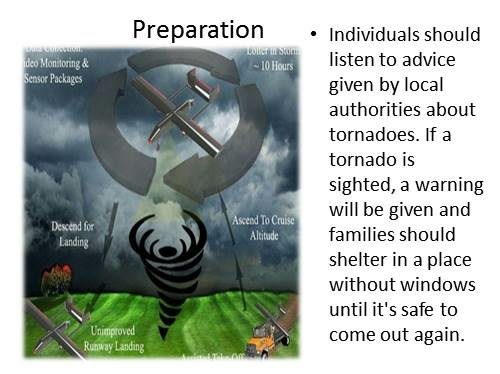 If a tornado is sighted, a warning will be given and families should shelter in a place without windows until it’s safe to come out again. 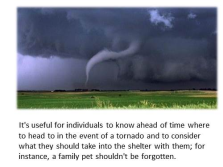 It’s useful for individuals to know ahead of time where to head to in the event of a tornado and to consider what they should take into the shelter with them; for instance, a family pet shouldn’t be forgotten. 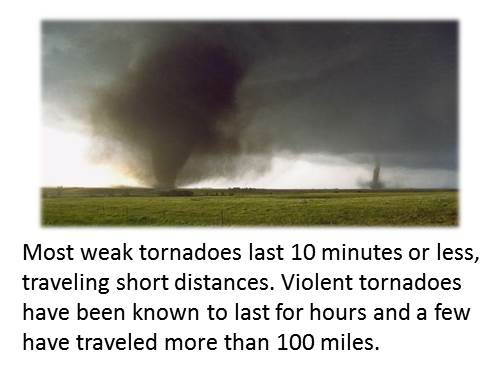 Most weak tornadoes last 10 minutes or less, traveling short distances. Violent tornadoes have been known to last for hours and a few have traveled more than 100 miles.